On 26 March 2019, during His private visit to the Pontifical Lateran University in Rome (known as “The Pope’s University” since most of his students are from the Diocese of Rome, even though nowadays the University is open to a great number of students coming from all over the world), the Holy Father, as proposed by the Magnificent Rector Professor Vincenzo Bonomo, received as a gift an artistic Crucifix. It has been commissioned and donated to the Pontiff by the well known Ukrainian patron of the arts Stella Beniaminova. The artist of the sculpture is the Ukrainian sculptor Alexanders Zhyvotkov, whose work is known for his profound expression of religiosity. Stella Beniaminova, an Orthodox like the author of the masterpiece, very well known in the Country for her promotion of artistic values, wishes to gather in this gesture all the expressions of gratitude of the Ukrainian people for the constant closeness of Pope Francis to all those suffering from the presently raging war, in a very special way through the action of “Pope for Ukraine”, which has contributed sixteen million euros as a result of a personal donation of Pope Francis and of a collection taken in all the parishes of Europe, already intended to take care of the primary needs of more than eight hundred thousand people suffering because of the war in the East of Ukraine. Mrs. Beniaminova is doing all this in favour of the art, convinced as she is that only the spiritual elevation evoked in artistic beauty will be able to help eliminate violence and banality in the world, opening luminous paths of hope that may allow different components to dialogue and to complete each other. This was also part of the conversation that the donor had with the Pope during their meeting at the Lateran University. 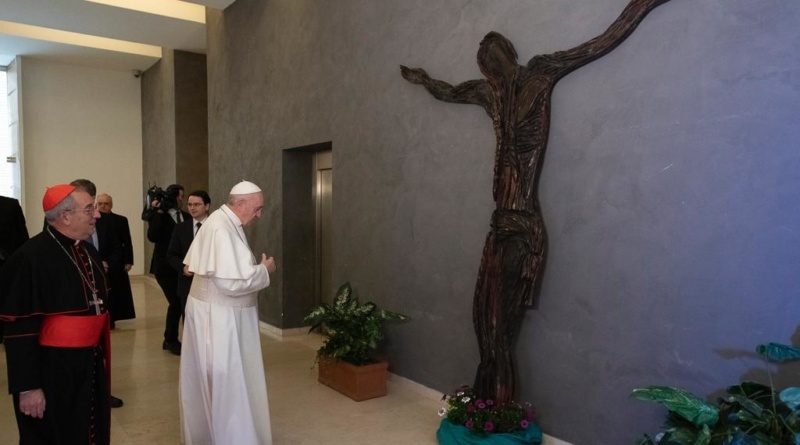 Pope Francis has been profoundly touched by the gift and by the message of Stella Beniaminova, who is of Assyrian descent, and, after having blessed the Crucifix which has been already destined by himself to be situated permanently in the atrium of “His” University, has spent some time in meditation in front of it, strongly affected by the symbolic value of the gesture and by the evocative strength of the masterpiece, and for which the Pope expressed his abiding gratitude to the munificent donor.